With party season in full swing, it can be a bit stressful trying to plan outfits for all the events that this time of year brings. 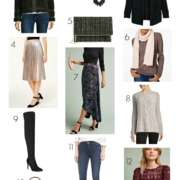 So, instead of reaching for my usual LBD, I’m challenging myself to branch out a bit & choose unexpected pairings that will keep me warm but still look chic (who wants to wear a dress when it’s less than 20 degrees out?!). These metallic trousers look so luxe and the fit is absolutely perfect – easy to move around in & ideal for pairing with winter pastels. To further prove their versatility, I’ve included two other ways to style them below (great for New Years Eve too)! 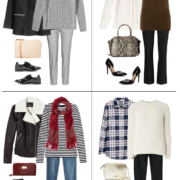 Need more ideas for holiday ensembles other than that same party dress you’ve worn for years? 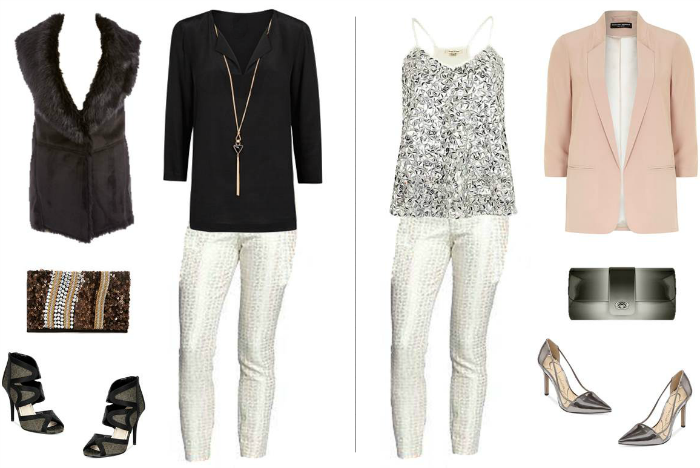 Try a sophisticated take on the modern tuxedo with this embellished blouse, a tailored blazer, slim pants & stilettos. Or if you’re the hostess and need to be comfortable while working in the kitchen & serving guests, go with a cozy sweater, pleated maxi skirt & these sparkly flats.